It wasn’t until I was deep into my pen addiction that I discover the wonders of NOS, or “New Old Stock”. I had seen the term before on places like eBay but never realized what great products could lie behind the designation. In a nutshell, NOS designates products that are no longer being manufactured but are still in new and unused condition. The product could have been discontinued, or had a design tweak that was cause for a new version. Whatever the case, many NOS pens are highly sought after by collectors. Rotring seems to be one of the most popular NOS brand names. Their industrial designs are timeless, and with all of the changes in the company over the years, many models are no longer being produced. While I haven’t gone on the hunt yet for some of the rarer pens like the Lava Series I was able to pick up the Rotring 600 Series Black Rollerball for a very reasonable $60 from a dealer at the Atlanta Pen Show back in April. It wasn’t on the shopping list that day, but how could I pass it up? I was smitten with it immediately upon first use. The barrel is substantial in both size and weight but remains comfortable to write with as long as I leave the cap unposted. It is too long and the balance is off otherwise. The refill I believe is a Rotring branded Schmidt rollerball and is a standard size so many other refills should fit as well. This one works wonderfully. It is rare that a pen makes you feel like a superhero. The Rotring 600 Rollerball has that special quality where when you use it you know it is different from most other pens. The only downside is it is going to cost me money as I search out more NOS goods. 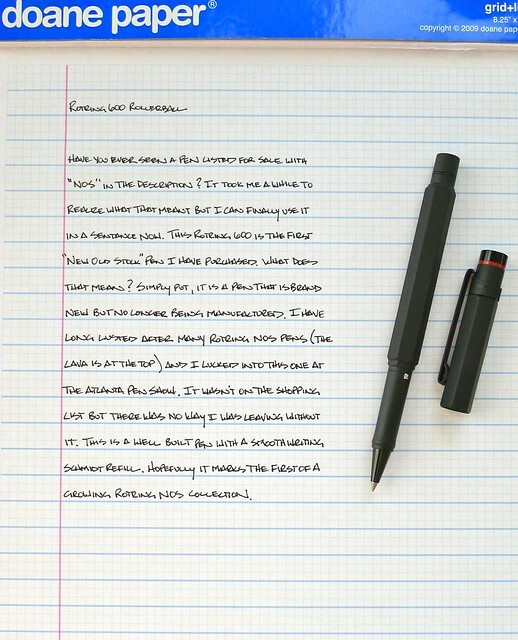 Posted on August 20, 2012 by Brad Dowdy and filed under 600, Pen Reviews, Rollerball, Rotring.